Villagers, who exchanges two items for one (for example, librarian who gives you enchanted book for normal book + emeralds), wants only the first item, when you reload the world/load that villager from the previous version, making it possible to enchant items or transfer gravel into flint without paying. They will also generate that trade again, in unbroken state, that will broke as the original one upon reloading. 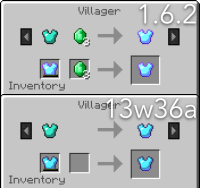 MC-34324 When trading costs two items, the second requested item will disappear after unloading the chunk where the villager is.